What happens when we don’t have coins in our pockets to make a quick donation? Will the presence of Salvation Army kettles on street corners each December soon become a memory of Christmas past? The five-week-long blitz remains popular with the public in theory, but fewer Canadians now carry physical cash, meaning they have nothing to stuff into the distinctive clear globes. This lack of coins and bills could reduce the effectiveness of that specific campaign, says John McAlister, national director of marketing at the Salvation Army. “There is an expectation that there will be a drop—and it’s likely to be a significant drop,” he says. 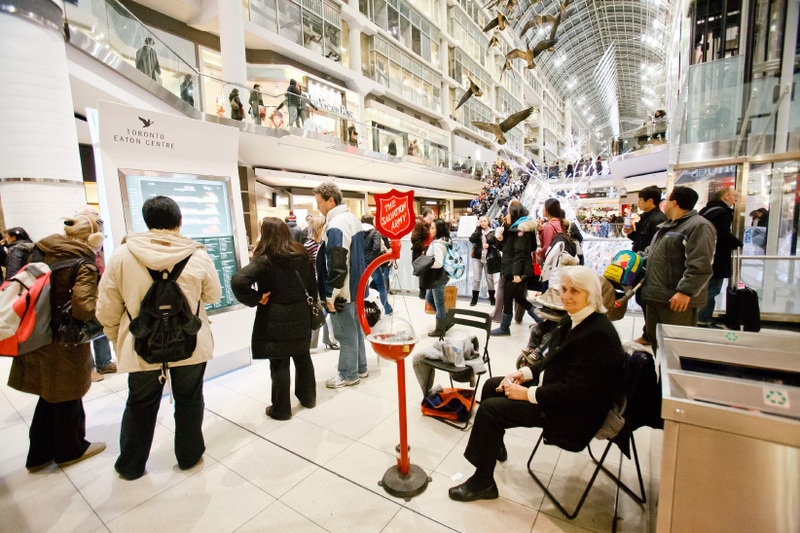 A poll conducted as part of The Canada Project suggests the Salvation Army’s concerns are well founded. The survey found credit and debit cards were far more popular with Canadians than cash as a form payment. Two in five Canadians rely on credit cards while just over a third favour debit. Cash comes in a distant third, with just 17 per cent of respondents saying they prefer physical money. This popularity cash may drop further as paying by mobile phone or app becomes more common. A year ago mobile payments weren’t even an option; now 2% of respondents say they reach for their phones before they grab their wallets. And yet, the value of all Canadian bills in circulation topped $77 billion in 2016, up $2 billion since 2015 and $33 billion more than in 2004, according to the Bank of Canada. But there are some tentative signs that the era of physical currency is waning. In 2016, there were 1.1 million fewer $5 bills in circulation than there were the year before. A decline in the supply of that denomination has only happened one other time in the past decade, between 2012 and 2013. And in percentage terms, the $2 billion hike in available paper cash is the smallest increase in more than 10 years. Laurie Campbell, the CEO of Credit Canada Debt Solutions, a non-profit counseling agency, dreads the day when Canadians abandon cash. Campbell says she was criticized by the banks two decades ago for saying debit card use would result in more people going into debt, because the users don’t see a running bank balance. “When you dole out cash, the mentality is very different,” she says. “People absolutely get into trouble by not using cash.” She notes the same can be said about the expanding use of credit cards since the 60s. Campbell fears young people are particularly susceptible to spending more in a cashless environment. Many younger consumers arrive in her office having used their debit card on frivolous things. The findings of the Canada Project survey supports this concern. Millennial are less likely to use cash and more likely to use credit than their parents. Surprisingly, the silent generation, anyone in their mid-70s or older, are the least likely to use cash. Just 9 per cent of this cohort favour cash while 62 per cent prefer credit. While credit counselors are nervous about alternative payment forms, retailers love them. “Credit cards allow people to make purchases they would otherwise defer,” says Karl Littler, vice-president of public affairs at the Retail Council of Canada. The biggest concern for retailers is the cost of the technology to be able to accept new payment forms. It’s an unavoidable expense, notes Littler. Every time a consumer swipes a credit card, it reroutes about 1.5 per cent of the purchase away from the retailer to the card company. Still, a cashless world has its advantages for retailers, such as reducing the risk of theft and counterfeiting. As for the Salvation Army, they are still trying to determine what comes next. As an alternative, the charity is exploring every option. In the coming year, shoppers are going to start seeing electronic card readers next to the Salvation Army’s distinctive red shield. Another idea that worked in other countries was hanging posters with a QR code that donors can scan to make a donation.